How to Select the Best Mountain Bike Helmets? Helmets are essential for protecting your head, which is vital in the tumble and rough world of mountain biking. The best part of mountain biking is the challenges you will face such as uneven terrain lined with ruts, roots, rocks and tight spaces. Maneuver through this terrain is a great fun. But, you can expect accidents at any time in this highly adventurous sport. Mostly, accidents occur when you lose control of your bike. Therefore, wearing the best MTB helmet is extremely important before you set out of your biking adventure. Besides, best and correct protective gear is also vital for your safety. If you are able to protect your head, you can prevent lots of head injuries, which are often fatal. Therefore, both children and adults must wear helmets when they participate in adventurous activities like biking, cycling, water rafting, skateboarding, etc. You must provide top most importance to safety when you select a helmet. Here are the best bike helmet reviews, which will surely help you to pick the right one as per your need. The best mountain bike helmets help you to fulfill your often-competing needs of comfort, protection, weight, and ventilation. How to Choose the Best Mountain Bike Helmet? Do you know how to select the best bike helmet? Many types of bicycles are designed for different disciplines of cycling. Similarly, many types of bicycle helmets are also available to cover the needs of different cyclists. Specific helmet designs are available for mountain biking, track racing, time trial, bike commuting and road biking. You can also find mountain bike helmets tailored to downhill riding, dirt jumping, endure racing and cross-country riding. Literally, dozens of manufacturers produce bike helmets. Some of them are very popular, but the others are not so much. Many different brands and technologies are available. Therefore, choosing the right helmet is a daunting task. There is a very little structural difference between the desired features of a mountain or road bike helmet, though the styles will vary. Mountain bike helmets may have integrated visors, but this feature will be absent in road cycling helmets because they usually impede vision while using with a drop handlebar. While dirt jumpers prefer increased protection, cross-country riders prefer ventilation and light weight. The priority of a road racer can be aerodynamic qualities, but a weekend or a commuter warrior prefers ventilation and protection. Regardless of your riding style, here are a few things you should look for while purchasing a bike helmet. Protection is the most important factor of a helmet. There are lots of government-instituted standards, and all of them should be followed while manufacturing a helmet. These standards can vary between continents or countries. In the United States, helmets must have CPSC approval, In Europe, CE sticker must be checked, and in Australia, it must be AS/NZS. Shock-absorbing expanded polystyrene is used for manufacturing most helmets. Shock-absorbing expanded polystyrene is used for manufacturing helmets. So, when you meet with an accident, the helmet will be crashed itself. Therefore, you can see a cracked helmet after a big impact. It means the material is doing its job. You should not use the helmet again once it is broken. Today, almost all helmets are in-molded. So, the protective inner material and the outer shell are molded together for providing extra strength. 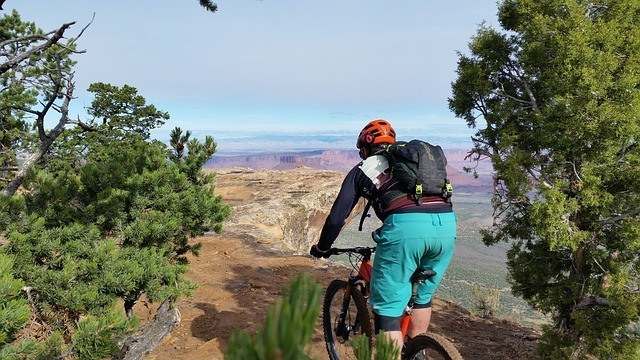 Systems such as Mips can be found in certain mountain bike helmets, which offer additional protection from rotational impacts, which are more frequent when out on a ride. Today, some mountain bike helmets even offer increased protection with a greater coverage and deeper fit at the back. When you work hard, your head is the most important place, which helps your body regulate heat. Therefore, ventilation is extremely important for keeping you cool when temperature shoots up. Usually, ventilation takes the form of multiple exterior vents or holes, air can flow directly to your head through these holes. the air channels are carved into the inner shell, which helps to direct air effectively to the hottest parts of your head. Then, this air is channeled to large exit ports. In such a way, your helmet can easily prevent your head from overheating. Larger, more open vent holes are the peculiar features of some mountain bike helmets. Compared to road cycling, mountain biking requires lower average speed. The vent holes are larger and more open due to this reason. But these types of helmets are not suitable for road cycling because they can create greater wind noise. Your helmet should not be too tight. It should be a comfortable and snug fit. If you measure your head, you can make a perfect move. To do this, you should measure the circumference of your head, which helps you to determine what size should try on first. You should try on plenty of different models and makes. The internal shape of all helmets is not same. Some manufacturers design their helmets in different models such as more oval, rounder, etc. Therefore, you should find one, which suits your head perfectly. The helmet should fit properly and stay in place during the event of a crash. In order to ensure these features, every helmet comes with a retention system. You should ensure that this is adjustable in the rear cradle. The helmet must be shaped ideally to hug the base of the skull to prevent the helmet popping off the front of your head when you hit the back of it. Padding is just as icing on the cake. It provides you maximum comfort. You can find adjustment of internal shape due to padding in a helmet. This is also highly helpful for wicking away sweat from the head. The anti-bacterial treatment in padding helps to prevent unpleasant smells. Visors protect your eyes against the glare of the sun. It also helps to prevent raindrops getting on your glasses or in your eyes. But, you should ensure that they do not obstruct your vision. Visors are not so useful for road bike helmets. But, it is more applicable to helmets for mountain bikers. If you select a helmet with adjustable visors, you can check how much they protect your eyes. Crash replacement is the other important factor while selecting a mountain bike helmet. Subsidized replacements are offered by many suppliers. If the helmet damages your lid within the first year or two, a crash replacement will be highly beneficial. You should consider it if you are particularly accident prone. You should not use strong chemicals or solvents to clean your helmet because they can damage the outer shell & can use mild soap and warm water to clean your helmet. You can take out pads to wash with strictly avoid exposing your helmet too high temperatures. If you maintain your helmet properly, you can use it around eight years. Smooth rounded shape, lengthy visor, and low rear make Giro Feature as one of the best protective trail helmets. The weight of this helmet is just 357g. It provides you a wide range of visual options. Hence, it is more than reasonable with its price tag. The rounded outer shell helps to slide even if you fall, which helps to prevent rotational injuries. Through the Feature was designed for all-mountain/trail riders, it works perfectly with all disciples of riding if you do not require full face protection. The Feature is ultra comfortable and lightweight, which provides more protection than the road or standard cross-country helmet. Besides, the Giro Feature goes largely by the rider though the extra features and coverage, which keep your brain safer. The Bell Sanction is an ultra light, full-face helmet and one of the least expensive helmets. Hand-laminated fiberglass shell is used for manufacturing this helmet, which is covered with an expanded polystyrene liner. The Bell Sanction is fully vented and it has an adjustable visor. The helmet is sized for junior and smaller riders. Moto inspired design lines of Bell Sanction makes it perfect for Super-D, all-mountain, and BMX riding. Troy Lee Design A-1 is considered as one of the most comfortable helmets because of its super-cozy padding. The interior of this helmet is dished out, which provides a feeling of head cradling and three-height retention system of this helmet prevents from budging an inch, even when you ride on rough terrain. Snug fit, secure, wraparound protection are the other features of Design A-1. It has 8 air intakes at the front and 8 exhaust vents. The construction quality and durability of Design A-1 are fantastic and padding of Design -1 is so dense. Hence, it can absorb sweat in a possible way. The helmet will not create any annoying eye drips. The Fox Flux MTB Helmet is designed for providing maximum protection and comfort to the users. so you will get the perfect one as per your needs. It provides you superior comfort even when you trek along the mountainside. The straps of Fox Flux are designed to prevent intertwining. At the same time, the material does not cause you any kind of problems. Proper ventilation, ease of use, light weight, etc are the other peculiar features of this helmet. The visor of Fox Flux MTB Helmet is made of high-quality material. So, it can protect you perfectly from glaring sunlight. Arguably, Smith Optics Forefront is considered as the most cutting-edge helmets around. It perfectly displays exceptional build quality. A honeycomb structure built is used by the Smith Optics Forefront around short plastic tubes, which sit perpendicular to the head. The two outer shell halves are held together by a carbon veneer framework. Comfort and adjustability of Smith Optics Forefront are excellent. It can remove any heat quickly and can absorb sweat effectively, which are some of the most outstanding features of this helmet. Two-position peak, light/camera mount, an integrated goggle hook, etc are the other stunning features. The Bern Unlimited Brentwood Summer is designed for serious bike races. The shape of this helmet resembles the helmet of a skater and it lacks the aerodynamic shape. But, this is a perfect bike helmet for a commuting biker who faces a myriad variety of seasonal as well as daily weather changes. The removable lining of Brentwood makes it highly versatile. You can select your lining on the basis of weather. there is no need of using sunglasses. You can also see the road without glare. Bern also comes with a summer lining without a visor. The lining is removable, which makes the Brentwood helmet a great option. Do you want to attack your ride with comfort, style, and confidence? The Bell Super 2 can provide you superior protection. The lower rear coverage of Bell Super 2 is superior to most other helmets. In order to provide additional coverage, the Bell Super 2 comes compatible with the Super 2R chin bar. Besides, Bells Overbrow ventilation and 23 vents offer superior ventilation. Mountain biking is highly adventurous and extremely sweet. This is one of the most interesting and entertaining engagements of a real man. But, the fun part ends when you get hurt. But, if you use the best bike helmet, you can avoid accidents and injuries. Wearing the best helmet is also the greatest way to enjoy this sport with maximum fun. You can also happily ride your bike on those mountainous terrains easily and effortlessly. Safety and protection have topmost importance when you select a mountain bike helmet. Bike helmet reviews are always helpful for evaluating the pros and cons of each product. The helmets described above can provide you maximum comfort, protection, and safety. Here are the best mountain bike helmet reviews that will help you to select the best mountain bike helmets as per your requirements and budget.